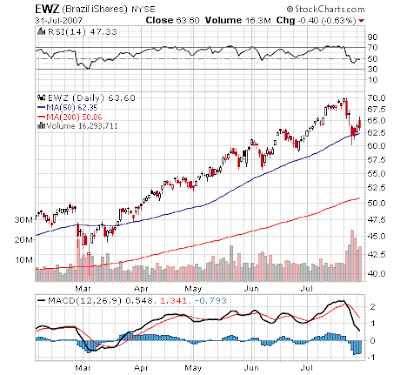 One of my favorite buy the dip plays, EWZ (Brazilian ETF), has pulled back to the 50 day moving average. There are two ways I am looking to enter this stock. I’m going to make a very small buy now, right around the support area, with a stop around $59-60. The next buy point is on a breakout of $70, the old high. It is best to play this very conservatively, since there is a more than small chance that the current bounce could setup a breakdown below support. Therefore, I will only make a small nibble here (around 250 shares). If we get a breakout of $70, that would be a signal that the stock only experienced a natural correction in the midst of a continued bull move. This is the level where I would make bigger position sizing entries. you are correct EFAT, the volume is a concern.